Earth Aware Editions, 9781683837046, 184pp. Contributions from Michael Pollan, Andrew Weil, Eugenia Bone, and many more expterts make Fantastic Fungi an awe-inspiring visual journey through the exotic, little-known realm of fungi and its amazing potential to positively influence our lives. An all-star team of professional and amateur mycologists, artists, foodies, ecologists, doctors, and explorers joined forces with time-lapse master Louie Schwartzberg to create Fantastic Fungi, the life-affirming, mind-bending film about mushrooms and their mysterious interwoven rootlike filaments called mycelium. What this team reveals will blow your mind and possibly save the planet. 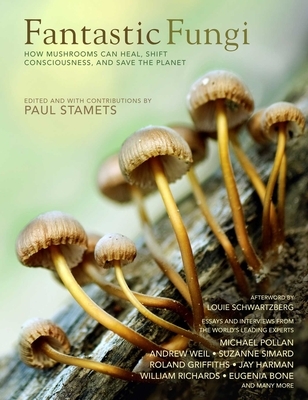 This visually compelling companion book of the same name, edited by preeminent mycologist Paul Stamets, will expand upon the film in every way through extended transcripts, new essays and interviews, and additional facts about the fantastic realm of fungi. Fantastic Fungi is at the forefront of a mycological revolution that is quickly going mainstream. In this book, learn about the incredible communication network of mycelium under our feet, which has the proven ability to restore the planet’s ecosystems, repair our health, and resurrect our symbiotic relationship with nature. Fantastic Fungi aspires to educate and inspire the reader in three critical areas: First, the text showcases research that reveals mushrooms as a viable alternative to Western pharmacology. Second, it explores studies pointing to mycelium as a solution to our gravest environmental challenges. And, finally, it details fungi’s marvelous proven ability to shift consciousness. Motivating both the visually stunning film and this follow-up book is an urgent mission to change human consciousness and restore our planet. LOUIE SCHWARTZBERG is an award-winning producer, director, and cinematographer whose notable career spans more than three decades. Schwartzberg has earned myriad awards, including two Clio Awards, an Emmy nomination, and the NAAPC Pollinator Protector Award. SUZANNE SIMARD is a professor of forest ecology at the University of British Columbia’s Department of Forest and Conservation Sciences in Vancouver, BC. ROLAND GRIFFITHS, PHD, is a professor in the departments of psychiatry and neurosciences at the Johns Hopkins University School of Medicine. His research focuses on the behavioral and subjective effects of mood-altering drugs. JAY HARMAN is a scientist, inventor, and entrepreneur dedicated to creating breakthrough technologies through biomimicry. He continues to conduct field research leading to new biomimetic products. WILLIAM (BILL) RICHARDS, PHD, is a clinical psychologist at the Johns Hopkins School of Medicine, where he and his colleagues have pursued groundbreaking research with entheogens or psychoactive substances. He is the author of one book and dozens of academic articles. ANDREW WEIL, MD, is a Harvard-educated world-renowned leader in the field of integrative medicine. Dr. Weil is the director of the Arizona Center for Integrative Medicine at the University of Arizona, has authored countless scientific articles, and has published over fourteen books. For more than thirty years, best-selling author MICHAEL POLLAN has been writing books and articles about the places where nature and culture intersect. Pollan currently teaches at both UC Berkeley and Harvard University and lectures constantly around the world. PAUL STAMETS is the preeminent mycologist in the United States. He has discovered several new species of mushrooms, pioneered countless new techniques, published several best-selling books, and won numerous awards throughout his forty-year career.